The local geography is currently made up of two microplates forming an important complex sea floor terrane that provides rich and diverse habitat for abundant and diverse marine life. As the Pacific Plate continued its northwest migration subducting under Alaska, it rotated the Arguello Microplate, also known as the Transverse block, forming the Southern California Bite. It is bordered on its eastern side by the Transverse Range, on the west side by the Channel Islands with the Ventura- Santa Barbara Basin in the middle, and to its north, the Arguello Canyon. The rotation ended with the capture of Baja that now presses against this block causing folding and uplift. Nearly all upwellings are seasonal and cover only one per cent of the ocean surface, usually near coastlines. Even rarer, perhaps as few as ten world wide, are constant or persistent year round upwellings. The persistent, nutrient-rich upwelling flows up the Arguello Canyon, enriching the Santa Lucia Bank, the Arguello Canyon and coastal waters from Point Sal to Point Conception. This upwelling is ranked as the most important of all the West Coast upwellings. As one of the few persistent upwellings in the world, it is critically important because it is the feeding hotspot for marine life migrating through the West Coast National Marine Sanctuaries. Supporting documentation can be found in NOAA’s Biogeographic Assessment of Channel Islands National Marine Sanctuary. The transition zone of the Oregonian and Californian (or San Diegan) Providences is the complex meeting place of south and north moving major warm and cold ocean currents and a blending of upwelling nutrients with warm water from the south and cold water from the north. The northern portion of the transition zone between Southern California’s warm waters and Northern California’s cold waters begins at Point Conception and extends two degrees north to 36 degrees north latitude (20 miles south of Point Sur at Mill Creek Canyon). The area is the meeting place of the Oregonian Temperate Eastern Pacific and the Californian Subtropical American Eastern Pacific climates and waters. The region is dependent upon, as well as a cause of, the complex interaction of the southward moving California current, the warmer northward moving subcurrent, the nearshore northward moving seasonal Davidson Current, and the upwelling. The dynamics are not fully understood. Systematic, ecosystem-based research is needed. Within this zone, a unique, complex interaction of species and natural phenomena occurs, feeding the web of life along the eastern rim of the Pacific Basin. The nutrients spread through and beyond both the Channel Islands and the Monterey Bay National Marine sanctuary areas, feeding plankontic communities, plants of the kelp forests, and various life stages of marine flora and fauna. Benthic (deep water) communities of world-wide significance thrive in the area. The high diversity and density of benthic populations resemble the North Sea and the Georges Bank, which have been two of the most productive regions in the world. The meiofaunal (small benthic invertebrates) community is among the highest density reported worldwide. The macroinfauna diversities and abundances are much larger than those north or south along the coast of California. The abundance of benthic populations appears related to the area’s unique combination of characteristics the transition zone, the geology of the area, composition of the sea floor, complex currents, and the upwelling itself. The Santa Lucia Bank area is frequently visited year round by cetaceans (whales, porpoises, dolphins). During the Fall season, at least 13 species of cetaceans have been observed, including simultaneous feeding bouts among humpback, Baird’s, fin, blue, and sperm whales and smaller species. Numerous fish species are harvested commercially. Among harvested species are sablefish, dover sole, shortspine, longspine, and rex sole. Flora and fauna of the area are associated with two distinct oceanographic and climatic provinces. The habitat is the southern boundary of the range for many northern species, and the northern boundary for southern species. Between the high and low tide lies a strip of shoreline that is regularly covered and uncovered by the advance and retreat of ocean waters. This meeting ground between land and sea is called the intertidal zone. Along rocky shores, the inhabitants are hardy and adaptable as they are subjected to a variety of harsh conditions. Organisms living in this area must be able to withstand periodic desiccation (drying out), changes in temperature, light and salinity, as well as strong wave action. Variation in the degree of exposure to these environmental factors can create marked zonation within the habitat. The Supralittoral Fringe or Splash Zone (about 4.7 to 7 feet above sea level): This zone is the area above the mean high tide level that receives spray from waves. Almost always exposed to air, the supralittoral fringe zone is sparsely vegetated and inhabited by relatively few animals. The rock Louse, Ribbed Limpet, and Black Periwinkle often inhabit this zone. The Midlittorial Zone (about 0 to 4.7 feet above sea level): This zone is the area that is covered and uncovered usually twice each day and where tide pools, abundant with life, are found. A wide variety of algae can be found in this zone. Endocladia, a red alga grows in the low-lying tufts, is often the dominant plant. Other common algae include Porphyra, Mastocarpus, Egregia (Feathered Kelp) and Pelvetia (Rockweed). In the rougher surf areas, Sea Palms (Polsteria) stand erect against the crashing waves. The invertebrates include mostly sessil species such a California Mussels, Gooseneck Barnacles, and Aggregated Anemones. Turban Snails, Hermit Cabs, Lined Shore Crabs, Purple Crabs and Sea Stars are common in the upper tide pools. Chitons are common on the sides of rocks. Tidepool fish include Striped Surfperch, Tidepool Sculpin, Tidepool Snailfish and Cabezon. The Subtidal Fringe Zone (about 0 to minus 2 feet below seal level): This zone is only uncovered during the lowest tides. The most densely populated of the tidal zones, it is marked by the brown kelp Laminaria and an increase in the growth of red algae such as Gigartine, Iridea and coralline red algar, Sessile, soft- bodies animals such as sponges, hydroids, bryozoans and tunicates cover the rocks. Sea Stars are abundant as well as Bat Stars, Purple Urchins, Giant Green anemones, Black Chitones and Kelp Crabs. It was once common to find Black Abalone in protected areas. The kelp forest ecosystems within the proposed sanctuary area are part of the transition zone and thus their are populations of the northern oceanographic providence and populations of the southern oceanographic providence invertebrates, fish, marine mammals, birds, plants, and more. The more includes the inter-relationships among the living organisms, physical features, bio-chemical processes, natural phenomena, and human activities in coastal ecological communities. Given the scale of the sum total of the global coastlines, kelp forests are not common. Considered the rain forests of the ocean, kelp forests are found along the coasts of Argentina, through the Straits of Magellan to Chile, off South Africa, Australia, New Zealand, and many sub-Antarctic islands, and from central Baja California to Sitka, Alaska. 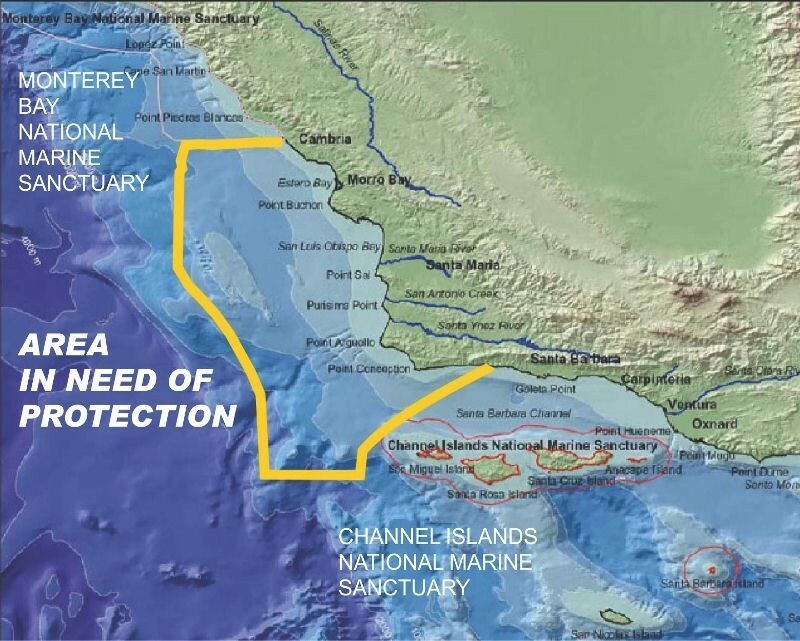 The most developed of all these kelp forests are found off of the California coast, from San Diego to Santa Cruz and the islands west of Southern California, especially the Channel Islands within the Channel Islands National Marine Sanctuary. Kelp canopies can reach depths of 200 feet. Different types of kelp and algae form under-stories which provide numerous benthic (bottom communities), mid-water, and surface habitats, nursery areas, protective covers, and food items important for invertebrates, fishes, and sea mammals. Seabirds roost and maintain rookeries on large exposed rocks close by or within the forests. Several endangered marine mammals, sea otters, northern elephant seals, harbor seals, and sea lions inhabit these areas and haul out on the rocks. Gray and humpback whales feed nearshore. Approximately 300 algae species are present. Rocky intertidal coastal marine habitats host an assortment of invertebrates and fish. Species such as blue rockfish and abalone use cracks and crevices for protection against predators and for breeding. Much of the California Central Coastline is dominated by rocky intertidal zones lush with large and significant kelp forests. Kelp generally requires rocky hard- bottom for attachment and growth, but physical factors such as light availability and amount and type of rocky substrata affect the range of each species. In this environment, kelp — fed by the rich nutrient broth carried by upwellings (constant and seasonal) and their associated currents — can grow 10 inches or more a day, forming a lush underwater habitat. The following species maps illustrate the highly significant international and national marine species densities and diversities of the proposed sanctuary area currently unprotected. These species are part of the larger marine ecosystem connecting the protected areas of the Channel Islands National marine Sanctuary and the Monterey Bay national Marine Sanctuary. These maps and many of the previous maps are products of NOAA’s research directed by both sanctuary programs. The ancestral Chumash arrival date into this area is at least 20,000 years ago given current archaeological dating. They arrived by watercraft. While many believe and think the ocean served as a barrier to humankind’s mobility, others see and know the ocean to be of service to mobility. On the east coast many finally accept arrival of peoples who followed along the ice by boat from what is now France over 18,000 years ago. Some on the west coast now accept the idea of a kelp highway lush with food sources along which the first people traveled by boat. 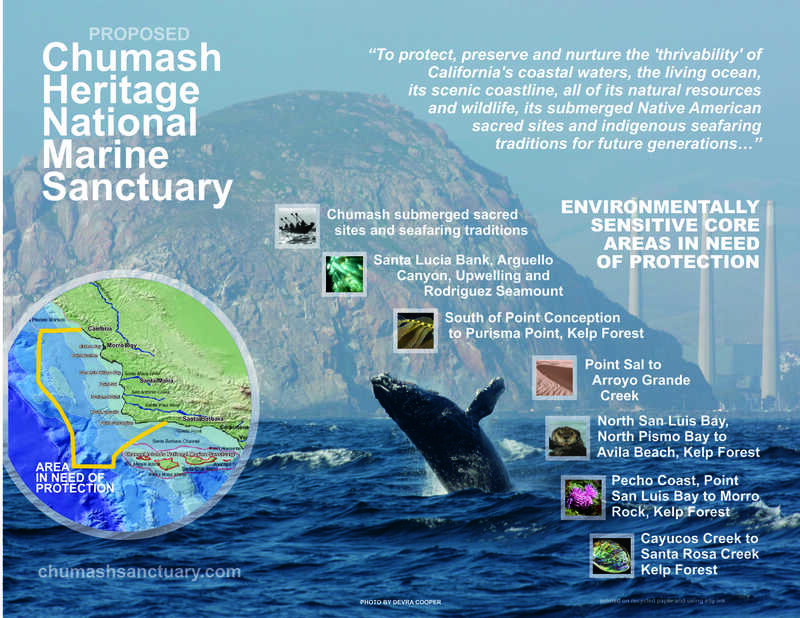 The Chumash have always been ocean going mariners with the Channel Islands being the original arrival point and new home. Over ten thousand years ago, they developed the first use of acorns in what is now San Luis Obispo County thereby becoming horticulturalists. They have been mislabeled as hunters and gatherers. Competent and accomplished mariners, they used their solar, lunar and stellar knowledge to create complex solstice and stellar alignments only now being recovered and admired. Many of these sites became submerged as the ice age melted into the present day.